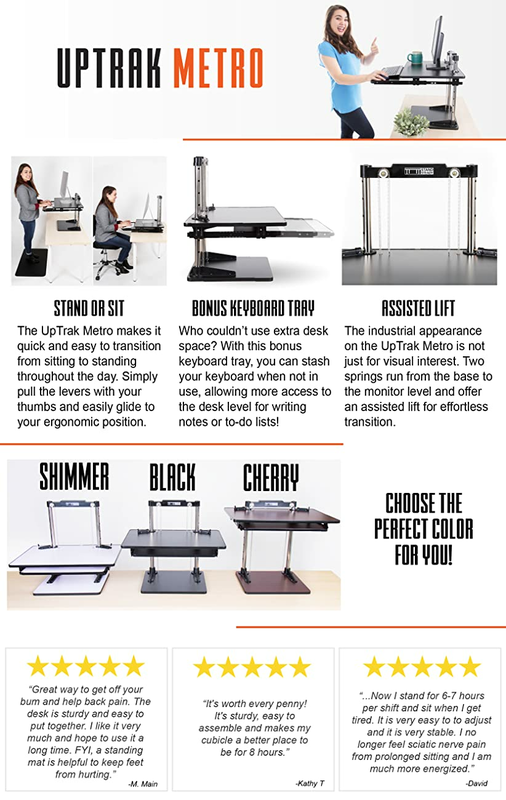 If you love the simplicity of the UpTrack adjustable desk riser, but would like a little help raising the desktop, you'll want to check out the UpTrak Metro. Like our other UpTrak models, it offers an ingeniously simple rail system that allows you to find the perfect standing height. It's also lightweight and compact, while still delivering plenty of room to work. What sets the Metro apart is a convenient spring assisted lift, which is nice to have when raising heavier desktop contents like a large monitor. It also offers a retractable keyboard tray, so no matter if you're standing or sitting, you can enjoy a comfortable typing position. ADJUSTABLE: A simple flip of the thumb levers lets you access the height adjustment. You can choose a setting anywhere between 2.25” to 18.25” above the desktop – that’s tall! SPRING-ASSISTED LIFT: You’re not difficult. Neither is the Metro. There's no complicated gizmos, and you don't have to plug it in. Instead, two springs which run from the base to the monitor platform offer reliable support as you move the desk up and down – Wow! And choose from selection of Colors: Black, Cherry or Shimmer White! FEATHER LIGHT: If you switch between work stations, portability and light weight matter...and this is not a strong suit of the other guys (we're looking at you, Flexispot, Varidesk, and Ergotron). At only 14.5 pounds, you can move the UpTrak Metro from one cube to another as easily as transporting your laptop. Need the quiet of a conference room for a few hours? You can carry the UpTrak Metro over with you. This adjustable height desk can go where you go! RETRACTABLE KEYBOARD TRAY: The retractable keyboard tray is like a Murphy bed for your desk – pull it out when you need it, and slide it out of the way when you don’t. It’s so great to have this option on a budget-friendly stand up desk workstation! Definitely a great experience so far, great quality for the price and it’s a worthy investment in your health! I’m a very active person that took an office job and I was in so much pain the first couple weeks of doing the 9-5 in chair all day - I was having all sorts of issues. This unit has allowed me to spend a majority of my day standing and staying moving which has made me more productive come 3-5pm when most people in the office are checked out at that point. Awesome product, great price, even better investment. First purchase was faulty on one of the arms - got in touch with them and they immediately replaced the product. Am anxiously waiting to move into a new office to put the new one to work!!!! I have to say that I was a bit leery about buying an item that had been returned. I was amazed that it arrived in tact and with all the bits and pieces attached. Not to mention the speedy delivery! After putting this item together, I realized it was perfect for my home office. I had read nearly all of the reviews about this item, so I was prepared for the fact that only the keyboard fit on the pull out tray. With a couple of modifications, I was able to adjust to having the the mouse on upper shelf with my monitors - it works great! The previous concerns that folks had about the stability of the unit...well I am 5'7" and I use it at the third from the top notch and it wobbles slightly, but not enough to compromise the stability. This doesn't concern me as it's not so bad and it simply reminds me to 'stop banging' so ******* my keyboard which reduces the wobble to almost unnoticeable. This product really is worth the money! Very satisfied customer! This thing works and costs much less than other options.